In October 2015, I bought a Chromebook with the intent of learning how to move my data-science development environment to the cloud. In exchange for an extra 5 minutes of setup, I now have a flexible infrastructure that can scale with the task. This setup is cross-platform in that it can be used on any laptop with Chrome, not just a Chromebook. Start a Google Compute Engine virtual machine instance. For Chrome Secure Shell, omit -f to keep the tunnel open (see screenshot). I use the Cloud9 IDE and connect the instance as an SSH workspace. Why did I move to the cloud? With a cloud-based platform, I only need a laptop as a web browser. I spent $170 on my ASUS C201 Chromebook with 4GB RAM. I spend $10 per month on a Cloud9 micro plan for SSH workspaces. I wanted a reproducible environment. Snapshots can serve as simple backups of instances. For more complex platform managment, there's the Google Cloud Shell. Why do I use Google Cloud? Why do I use IPython Notebooks? IPython (Jupyter) Notebooks are an important part of my development process since they enable me to prototype quickly and to share my work in-progress. The notebook serves as a top-level script, the parts of which I eventually modularize as components of installable packages. I prefer the Continuum Analytics Anaconda Python distribution for its Conda package manager. I'm using Python 3.5. Why do I use Cloud9? I saw that Cloud9 is popular and has good documentation.3 I wanted a cloud-based IDE since I didn't want to spend resources on my Chromebook or on my instances to run the IDE. Make a project in the Google Developers Console. Firewall: Allow HTTP and HTTPS connections to use curl and wget. Project access: Reserve an external IP address ("Networking" > "External IP"). Other settings can be left at default.6 For this example, I give 123.123.123.123 as my instance's static external IP address. Connect to the instance, e.g. with Google's in-browser SSH. Install Python on the instance. View the server at http://localhost:8888. Install Node.js on the instance. Close the Cloud9 workspace tab. "Stop" the instance in the Developers Console. For a simple backup of the instance, create a snapshot from the Developers Console. This can be done while the instance is running. Shutdown the instance as above. Create a snapshot of the instance. ...if changing the machine type, set the new machine type. ...if changing the disk size, set the new disk size. Chrome app cookies.txt to export cookies from Chrome for wget. To inspect system resources, chrome://system in Chrome's address bar. To inspect RAM usage by Chrome, chrome://memory-redirect in Chrome's address bar (from the Chrome Task Manager). Chromebook 2GB vs 4GB Demo. I had to upgrade from a 2GB RAM Chromebook to a model with 4GB RAM since I typically use about 2.5GB RAM while working. Using a Chromebook as a developer. I've had my Chromebook for 2 months and haven't yet needed developer mode. Low-profile flash drive to expand the Chromebook's storage. Chomebook app Caret text editor. Classic Shell Scripting (2005, O'Reilly) was my formal introduction to Bash and Linux/Unix. Choosing between Debian and Ubuntu. SSH port forwarding (tunnels) explained. Google's recommended best practices for securing communications with Compute Engine instances. 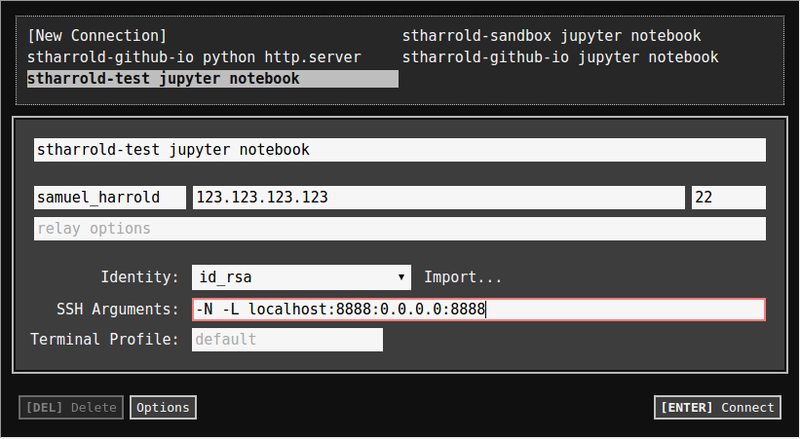 Running an IPython Notebook from Amazon Web Services. Hosting a password-protected IPython Notebook on Google Compute Engine. Thanks to John and Julie for their early reviews.